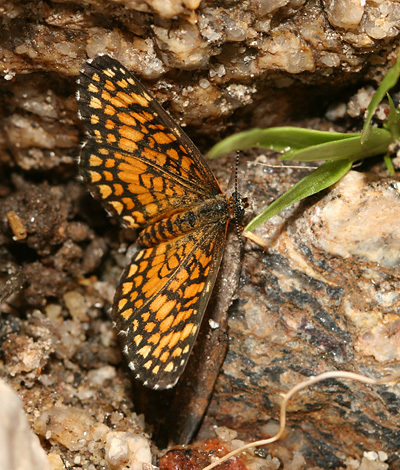 I spotted this little Elada Checkerspot (Texola elada) butterfly resting in the shade near the stream at Molino Canyon Vista Overlook in September. Elada Checkerspot butterflies have a double row of bluntly triangular orange spots along the dorsal wing margins. These butterflies are fairly slow, weak flyers, and they aren't very large, with 0.9 to 1.25 inch (2.2 to 3.3 cm) wingspans. Many of our Checkerspot butterflies are quite difficult to identify in the field as they are similarly small with orange checks or spots and dark brown lines on their wings. However, once captured with a camera, their photos are much easier to compare to reference photos and thus identify. Adult Elada Checkerspots feed on flower nectar, while their caterpillars feed on plants in the Acanthus family (Acanthaceae), such as Longflower Tubetongue (Justicia longii) and Thurber's Desert Honeysuckle (Anisacanthus thurberi) here in the Sonoran Desert. Most plants in the Acanthus family are tropical or subtropical, and those that are found here in the Sonoran Desert are remnants of a distant, subtropical past climate. Elada Checkerspot butterflies themselves are a predominantly Mexican species, and here in the U.S., they are found in the southern parts of Texas, New Mexico, and Arizona.